Some people were born to fight political battles. Thank goodness for them. I am not one of them. I usually try to avoid talking politics. Not because I don’t care, but because I do care, deeply. Debate is not my strong suit, political arguments leave me feeling tense and often angry. The polarity and unwillingness to compromise leaves me with a sense of dread for the future of the USA. So, when I saw a call for entries in a juried show for jewelry with a political theme, my first inclination was to stay out of it. After all, I want to make jewelry that is beautiful. What’s beautiful about politics? What could I possibly make that would fit the theme anyway, aside from a donkey and an elephant? These thoughts were rolling around in my mind one day when I remembered a particular slab in my collection of lapidary rough. It was Montana Agate, full of natural divisions, fractured, just like our political process. 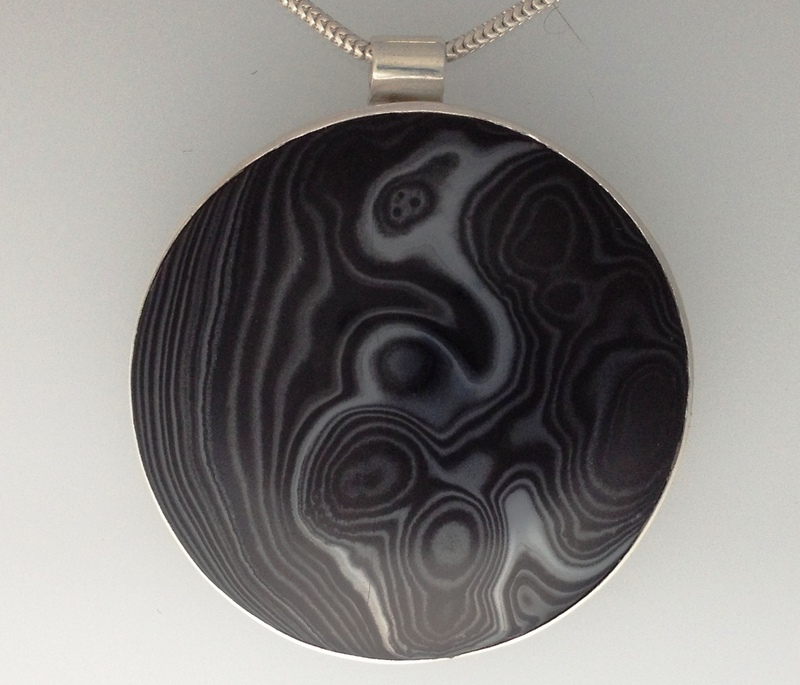 From that inspirational moment came the pendant “Fractured”. 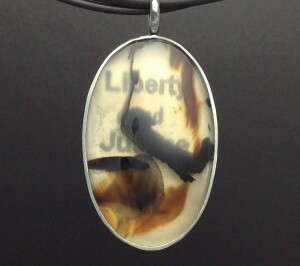 The front of the pendant illustrates the feeling that fracture, division, and unwillingness to compromise are overshadowing the basic democratic principle of “Liberty and Justice for all”. 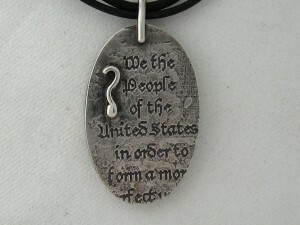 The back of the pendant is etched with the opening words of the Constitution of the United States accompanied by a question mark. The show entry fee included two pieces, so I needed to come up with another inspiration for a political statement, great. Again, inspiration came from my rock collection. From the moment I saw this slab of beautiful blue and green stone (Chrysocolla, I think), I wanted to make a reversible “Peace on Earth” pendant with it. 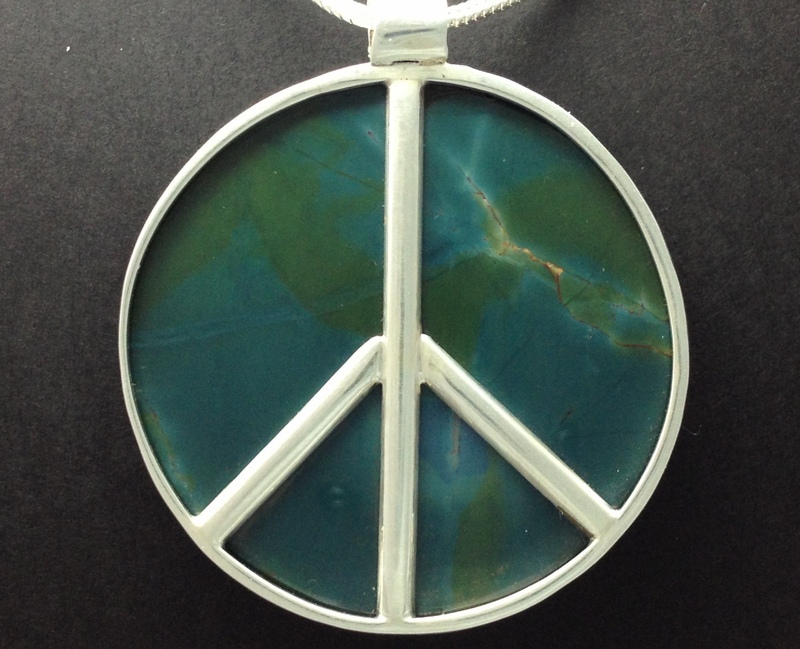 In keeping with the theme of controversy and opposing viewpoints, it seemed only natural to represent the alternative to peace on the flip side of the pendant. Black on black psilomelane is used here to represent the black smoke curling above sites of war, violence and terrorism. Politically themed jewelry? I wouldn’t have guessed it either! I really like this piece. I am a child of the 60’s and can relate. It now makes me sad that I plan to go as a “flower child” for halloween. Maybe there is still hope. Previous post: The Spiritual Show, I’ve been accepted!